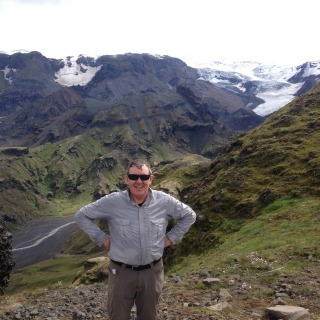 Senior Travel Iceland is a great retirement travel option. 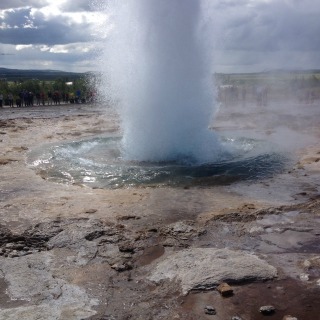 A place of natural wonders, a land of fire and ice. I was privileged to be guided by Steinunn Harðardóttir on the tour she describes in this inspirational travel story. Active seniors will enjoy memorable adventures in this unique country. The scenery is dramatic with unusual colours in the mountains, and hot water springs abounding. This landcape is a true walker’s paradise, offering intresting and chalenging walks. 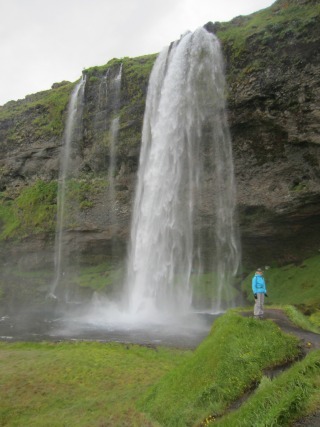 This article, written by Steinunn Harðardóttir, describes some of the walking areas in the vicinity of Reykjavík frequented by the locals, as well as some of the most popular tourist atractionas of Iceland- Gullfoss Waterfall, Geysir hot springs area, and Þingvellir National Park, and a stunning walk in the remote Þórsmörk valley, under the famose glacier Eyjafjallajökull, whose eruption caused enormous disruption to European air travel in April 2010. Reykjavík, the capital, is a short drive to many exciting trails on the Reykjanes peninsula and Hellisheiði heathland. This peninsula is a home to a multitude of geological phenomena and seemingly endless lava fields, and here is the only place in the world where the mid-Atlantic ridge rises above the sea level. The Hellisheiði heathland is the second biggest high temperature geothermal area of Iceland, with abundance of hot springs, in which it is possible to bathe. Enjoy the famous and beautifull Gullfoss Waterfall, the spectacular sprouting Geysir, and walk in the UNESCO site of Þingvellir National Park. The stunning glacier valley of the Thunder god Thor (Þórsmörk), is a rugged area set between three glaciers, one of which is the famous Eyjafjallajökull, will delight you. 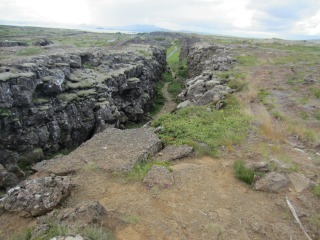 The drive through the outdoor park of Heiðmörk is the the beginning of a trail that goes through the lava bank of the Búrfell crater or Búrfellsgjá, which means the Crevice of Búrfell. Búrfellsgjá is a shallow crevice or indentation that was formed in an eruption at the Búrfell hill some eight thousand years ago. 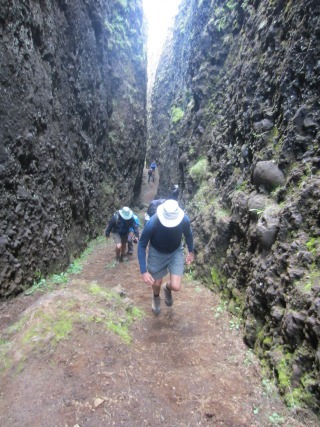 The walk goes through this green-grey moss-topped lava bank up to the crater. On the way is a beautiful sheep pen and sheepfold built in 1839, which was used for gathering the sheep until beginning of last century. Walk around the crater and go on to the mountain of Húsfell 228m. The view from the top is spectacular. After a visit to an interesting cave cross the hill of Valahnjúkar, end the walk by an underground river and water reserve at Kaldársel. You can literary walk through a small mountain Lambafellsgjá, one of the secret gems of Reykjanes. The Reykjanes Peninsula is a young section of Iceland. It is a land-born, highly volcanic counterpart of the Mid-Atlantic Ridge, where two tectonic plates diverge at an average rate of 2.5 cm a year resulting in lot of rifts along the peninsula among others this one. We then walk up to the green mountain of Grænadyngja 393ms. After having enjoyed the superb view to Keflavik and over the entire peninsula we go down in to the crater of Sogaselsgígur where we find ruins of sheep pens and summer dwellings. We walk on to the stunning area of Sogin where hot water activity has changed the colors of the soil into beautiful color spectrum of pink, yellow, light brown, white base and many others. From here we go on exploring and walk up to the beautiful lakes of Spákonuvatn and Grænavatn. We drive around 30 minutes to east to the Hellisheiði heathland, which is the second biggest high temperature geothermal area of Iceland, with an abundance of hot springs. 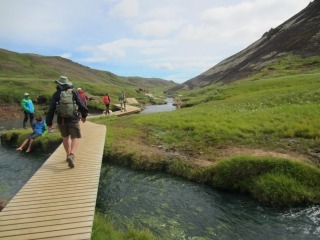 The trail offers a rare and secluded look at every type of hot spring Iceland has to offer, and enjoy a great bath in a naturally hot river at the end of the valley. We start walking at the interesting geothermal power plant of Hellisheiði, the third largest in the world. 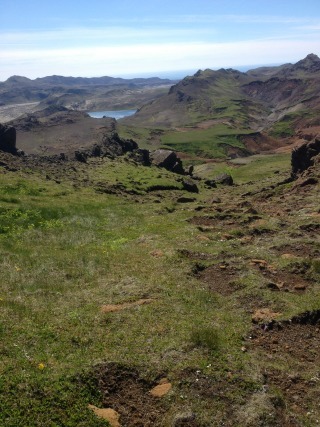 From there we start climbing up to the valley of Innstidalur. 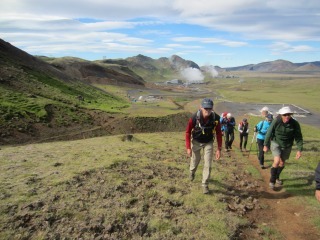 There we pass interesting hot spring areas and mountain huts used by the scouts. We go on following the mountain slopes of the mountain of Hengill until we come to the little valley of Reykjadalur where we can take a comfortable hot bath in the wild before we walk the last 3 kilometers of this walk. Overnight at Stora Mörk farm in the south of Iceland near to Þórsmörk where we stay two nights. We make the exciting drive through the many rivers on the way to Þórsmörk valley, with its rugged nature, cornered in by glaciers and their mighty glacial rivers, criss crossed by towering canyons and the steep foothills of the Eyjafjallajökull. The 25 km drive which can take up to an hour and a modified 4x4 vehicle is needed. In an eruptino 2010 a flood of melt water and small icebergs broke from the volcanic crater, ripped the glacier to shreds and flooded the area completely. We start the walk in this interesting area set between 3 glaciers. 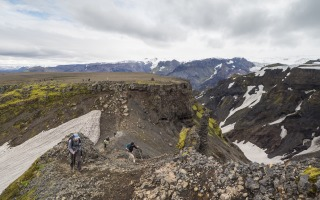 We walk along the narrow Kattarhryggir (‘Cat Spine‘), a thin ridge with long drops, up to Morinsheiði plateau for a view of the new lava form the site of the first of two volcanic eruptions in 2010. We start early and take a short stop at the interesting 60m Seljarlandsfoss waterfall, which you can walk behind into a small cave. We proceed to the most popular sights of Iceland‘s Golden Circle, the beautifull and powerfull Gullfoss Waterfall, the exciting Geysir area, with the hot spring Strokkur sprouting 20-30 meters high water columns every 5-10 minutes, and the UNESCO world heritage national park of Þingvellir. Þingvellir is a key location in Icelandic history, as the oldest existing parliament in the world, first assembled there in 930 AD. Iceland is located in the North Atlantic Ocean just south of the Arctic Circle. It lies about 970 kilometers west of Norway and about 287 kilometers southeast from Greenland. 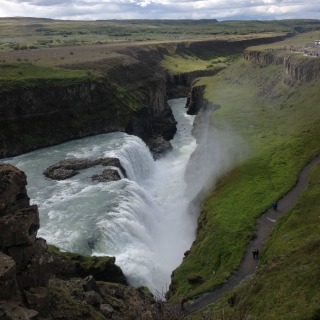 Iceland is geologically a part of both the North American Plate and the Eurasian Plate. It is the only place in the world where the Mid-Atlantic Ridge is visible above sea level. Iceland lies on the Mid-Atlantic Ridge, the boundary between the Eurasian and North American tectonic plates.